Grasshopper Valley Cabin has all the conveniences of home with front room, dinning room, kitchen, 1 bathroom with tub/shower, utility room, with washer/dryer and utility sink and two bedrooms plus loft. We have no fireplace or dishwasher but we do have plenty of parking and are easily accessable. 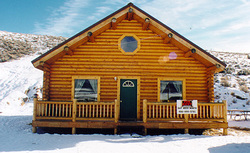 Cabin is in a great location in the Grasshopper Valley with restaurant, swimming, fishing, hiking within a few miles. We also have skiing and snowmobiling in the winter. We rent cabin by the day, week or month. Children 12 years or under stay free. Directions: To locate the Grasshopper Valley Cabin from Butte, Take I-90 west to I-15. South on I-15 approximately 62 miles, south of Dillon exits. Take exit 59 (Jackson, Wisdom) to Highway 278. West on Highway 278 approximately 32 miles to Pioneer Mountain Scenic By-Way (Polaris). Approximately 3 miles on By-way cabin on right just off road.